Welcome back to our Islam for Reverts Series. This article has been written to explain what invalidates Wadu. It is a part of a bigger series that are we at Hidden Pearls have doing for our revert brothers and sisters in order for them to easily learn about Islam. We hope you are able to gain some valuable information from it. Do check out our other articles in the Islam for Reverts series. During the research and production of this video & blog post, we came across so many conflicting opinions on what breaks wudu and what doesn’t. Different schools of thought vary widely on this issue unfortunately. Especially in the cases of ruling on general bleeding & vomiting, we were even surprised that there seems to be no correct answer. We have tried to present both sides of opinion and thus trying to empower you to make the decision. Also we ask for forgiveness from our creator Allah (swt) if we have got anything wrong. We do stress two points here both of which are very important Islamic teachings 1) Err on the side of caution 2) Don’t over-burden yourself. 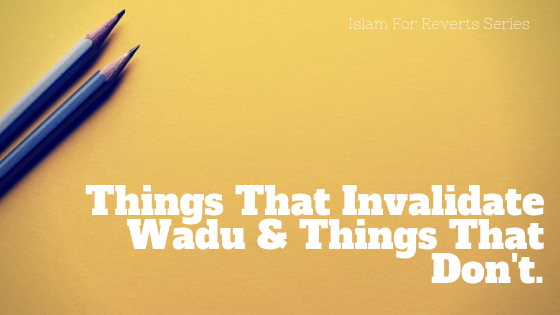 The purpose article is simple, sisters have been asking us what types of things invalidate Wadu, and we decided to write this article in order to help you understand this better. If you don’t like reading, there is a video available to watch right below this and it covers the same information. Any discharge from the front or back passage (urine, stools, wind, etc). This includes vaginal discharge except for wind emitted from a woman’s front passage. Just to make it clear, discharge may not necessarily be impure, but because you don’t know whether it is coming from the cervix or the walls of the private parts, its better to take it as being impure and do Wadu. Wadu needs to be done each time any of these actions take place. However it is important to note that we should give into waswasas! Because according to the hadeeth of ‘Abd-Allaah ibn Zayd, a man thought that he had broken his wudoo’ whilst praying when he had not done so, and the Prophet (peace and blessings of Allaah be upon him) said: “Do not stop praying until you hear a sound or smell an odour.” So If something happens in your stomach and you are not sure whether you have broken your wudoo’ or not, then the basic principle is that your wudu still holds! And this is easiness in Allah’s deen for us Muslims. Periods break wadu. Once you are on your period your wadu is broken. Some women will do wadu during their period, but seeing as periods break wadu its kind of pointless doing this. I would like to make an important point here. Periods are different to bleeding in between periods. Some women can bleed in between periods due to an illness, due to taking contraceptive tablets or some other medical reasons. This bleeding is ignored as the Prophet (Saw) has said that this would be seen as a vein bleeding and not your period. However, each time you bleed you need to do wadu. Basically same principle as urine, discharge. Yes it can be a nightmare but it needs to be done. Blood – this is a major issue people a lot of people stress over and trust me there was a time I would panic over a spot of blood trying to decide whether I should pray or wait for it to go away. I would seriously spend ages trying to get the blood to stop so that I could pray, and at times I would even miss my prayers. If your blood flows from where-ever the cut is, it is impure and you have to do wadu again when it stops according to lot of Islamic scholars. However, if it is bleeding for a long time and you risk missing prayers, then put a bandage and do wadu over it. A CUT that does not have blood flowing but sits against your skin will not break your wadu! Surprised? It’s true! By the way, pus has the same ruling as blood. Another way wadu can break is Vomit, if you vomit a mouthful that will break your wadu. Mind you, even a little vomit can have some people doing wadu again. But just to repeat, it needs to be a mouthful. Just to make it clear there are opposing views here Some scholars are of the view that vomiting does not invalidate wudoo’, such as Imam Abu Haneefah and Imam Ahmad. But Imam Ahmad also stipulated that vomiting does invalidate wudoo’ if there is a large amount of vomit. Imam al-Shaafa’i was of the view that vomiting does not invalidate wudoo, and this is possibly the correct view, because there is no sound evidence to show that vomiting invalidates wudoo’. Losing one’s mind breaks Wadu – which may mean losing it altogether (insanity) or by losing it temporarily for a certain length of time for some reason such as sleep, unconsciousness, intoxication. Eating camel meat, requires doing Wadu after it. Touching one’s private parts or your partner’s private parts will mean having to do wadu again according to many scholars among the Sahaabah and those who came after them of the Taabi‘een and the imams, including Maalik, al-Shaafa‘i and Ahmad. However there is difference of opinion in this case as Imam Abu Haneefah was that it doesn’t invalidate wudu. Some of the scholars differentiated between touching the private part with desire and without desire. Wudoo’ is invalidated if it is touched with desire, and it is not invalidated if it is without desire. So to sum it up if a person touches his private part, it is mustahabb for him to do wudoo’ in all cases, whether he touched it with desire or not. If he touched it with desire, then the view that it is obligatory (for him to do wudoo’) is very strong. With regard to touching it from behind a barrier, that does not invalidate wudoo’. In any case just touching your husband or wife, or kissing and hugging does not break it unless you emit some sort of discharge. Kissing or hugging your wife or husband does not invalidate wadu unless you do so with desire and there is a discharge as a result. Cutting your nails does not break wadu. Crying does not break wadu. Sleeping without losing conscious or without leaning against something else if it’s very light and not deep. I hope this has helped you guys better understand what things break wadu. If you have any questions or comments please leave them below and we will get back to you. Check out other Revert Series Articles as well if you are interested in learning more about Salah. This entry was posted in The Hijab Diaries. Bookmark the permalink. How Can You Deal With A Cheating Husband?